I made this cheese basket for a ghoulish gathering of friends last weekend. 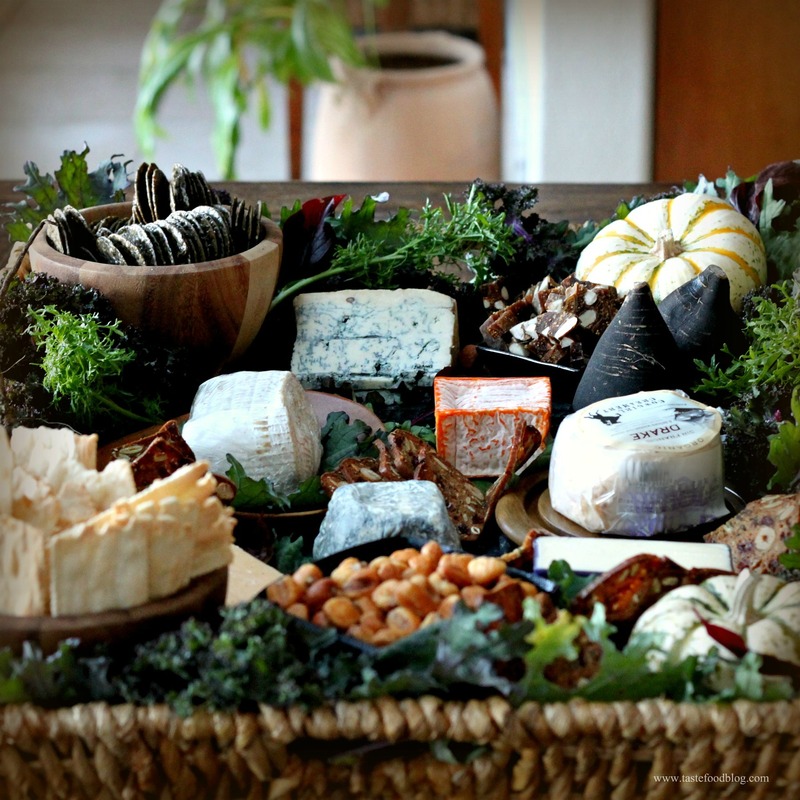 Cheeseboards and baskets are fun to make and with a little thought and creativity can easily take center stage at a buffet table. I never tire of arranging and decorating them, using the season and holidays as inspiration. For this Halloween-inspired cheese basket I picked autumnal decorations with a creepy twist. I created a border of spiky, frizzy greens with dark, purplish leaves and black, woody garnishes. The cheese selection was equally ghoulish: ash-rubbed cheese, a moldy blue, stinky and runny cheese and orange pockmarked cheese. The crisps and crackers were dark, rough and seeded, weaving through the cheese like wood in the forest. 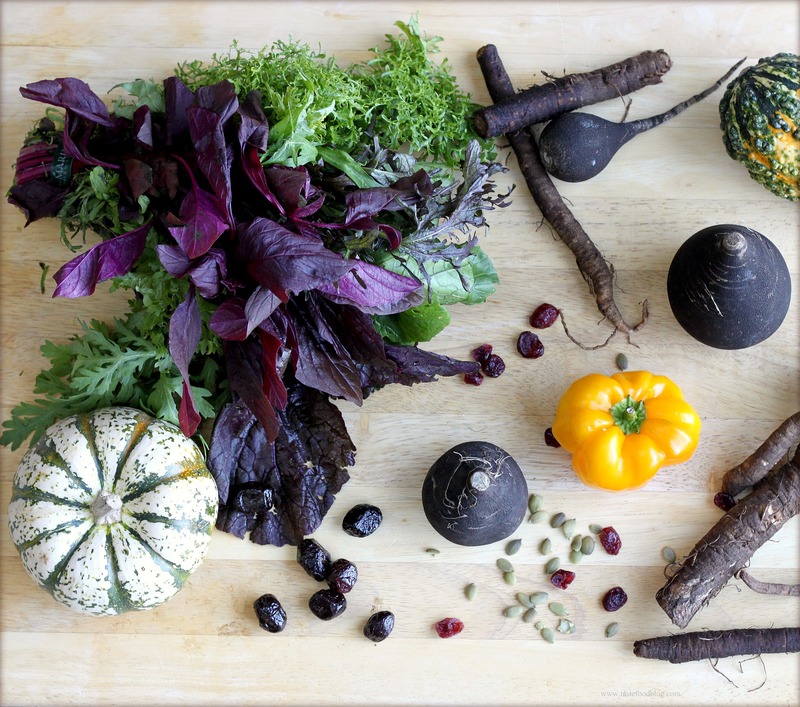 Mustard greens, chicory, purple kale, frisée, miniature red pears, black radishes, burdock root, gourds and baby pumpkins, black olives, pumpkins seeds, dried currants and cranberries. Corn nuts, black sesame rice crackers, cranberry hazelnut crisps, crisp flatbread, and chunks of dense fig and almond cake. Black slate created the background and lined the basket interior, provided a sturdy surface to cut the cheese while various wooden and black vessels contained wayward runny cheese and little nibbles. Not only did the cheeseboard look good, it featured a thoughtful selection of cheese that ranged from soft and mild to strong and aged. When you gather a selection, try to balance it in strength, texture, flavor. As a starting point I often include a blue cheese, a creamy white-molded cheese such as camembert, a goat cheese and a hard alpine cow or sheep milk cheese. 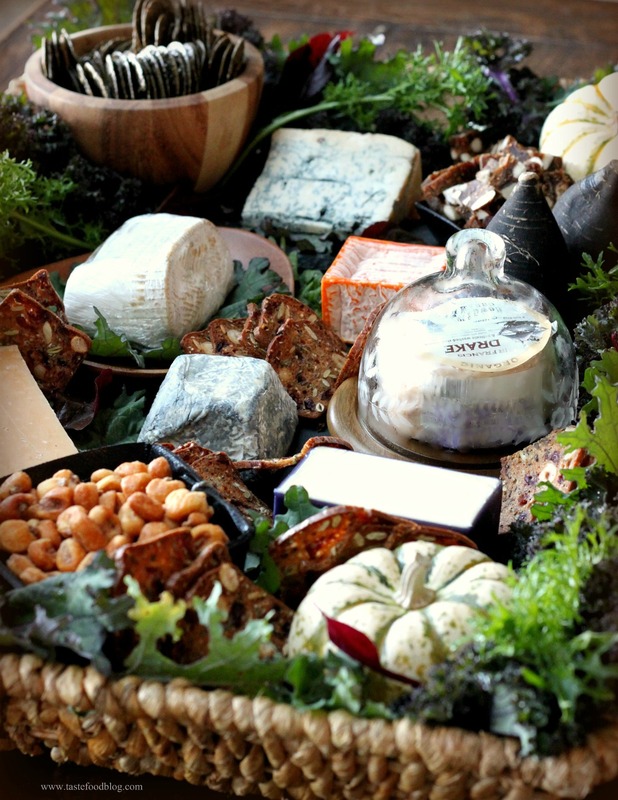 So have fun – enjoy all of the fabulous cheese and remember to save some for the guests. Bon appétit! That baslet looks amazing and so beautiful! 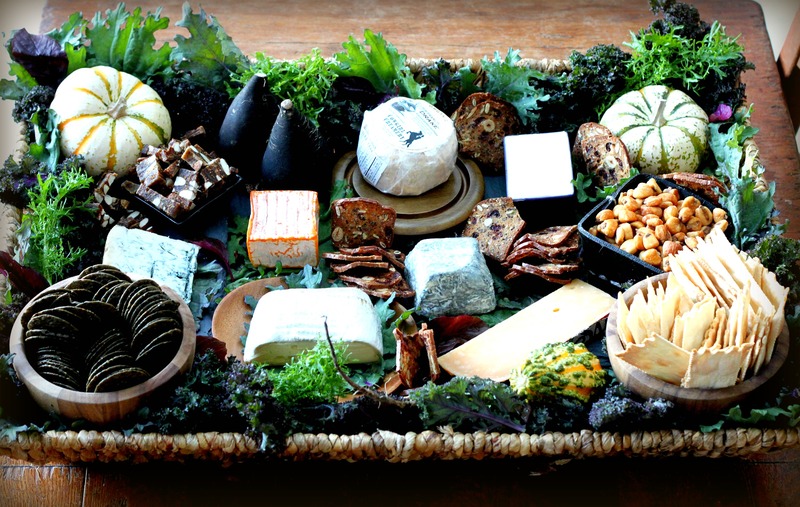 What an incredible cheese tray, perfect for your halloween gathering. Just gorgeous! I apologize for any typos there may be in this comment. It’s hard to type and wipe drool off your chin at the same time! Beautiful cheeses! That is by far the most amazing cheese board display I’ve ever seen. So creative and what a great mix of cheeses. really loved ready about how you put it together too, thanks! What a lovely idea. And just the perfect thing to balance all the sugar on Halloween! Gorgeous! The idea is perfect and the presentation sublime.